The stompa casa 4 hi sleeper is basically the original casa from its launch in 2007 and is still one of the best selling models in the range as it offers a sleeping area and a writing area. The casa is available in 3 different colour-ways and can be made up with desk or sofa chair on either side. 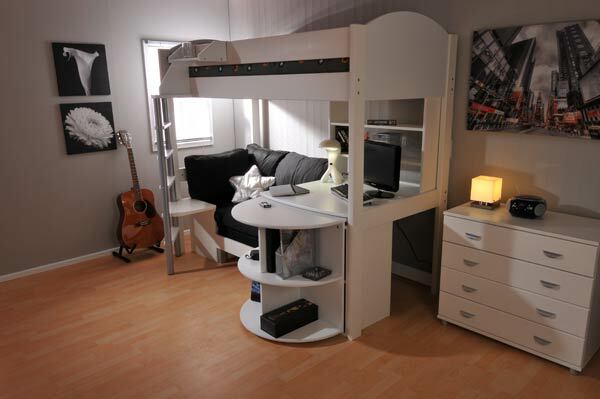 The desk fully extends to 215cm and has a small bookshelf that sits on the top. 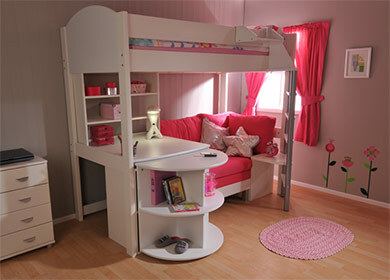 A stompa mattress is available at an additional cost, as is a clip on shelf. There are 4 colour-ways for the cushions and a option to purchase a stompa mattress with a choice of either coil or pocket spring available . All stompa beds are delivered flat packed to your door for home self assembly, however stompa have recently introduced a home delivery and assembly service for £99.